In recent years, the presence of metal impurities has become a major issue in the drug-making industry, and thus, the need for its effective removal. 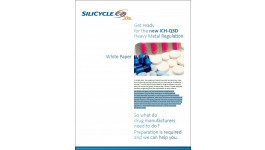 For almost two years now, the International Conference on Harmonisation (ICH) has been working on its Q3D guidelines for metal elemental impurities in new drugs and new formulations containing known ingredients. After many revisions and improvements, the final version or the Q3D guidelines was finally accepted and signed off by the ICH Steering Committee in December 2014, hence requiring that the entire manufacturing industry and supply chain follow these regulations.